Scented with spice and sea spray, Galle is an almost tropical feeling little city, sitting on and around a little wedge of land jutting into the ocean. Before the Portuguese arrived in the 16th Century, Galle was a small village, but they quickly turned it into a major spice port, building an impressive fort - now considered the best example of a fortified port built by Europeans in South-East Asia - covering most of Galle's ocean promontory. The Dutch arrived in the 17th Century, and added to the fort, as well as building their homes and churches, so today's Galle is a beautiful mix of local and colonial architecture, and the best places to stay in Galle are among these beautiful buildings. The, now UNESCO Heritage Listed, fort is full of bijou shops and cafes and boutique hotels. It's a hang out for writers, artists, poets etc.. And beyond that is a charming warren of streets. But this isn't just a historic fort and an old colonial port, it's very much a working administrative centre, and the city is full of real inhabitants, not just visitors and ex-pats who've been bewitched by Galle's allure. 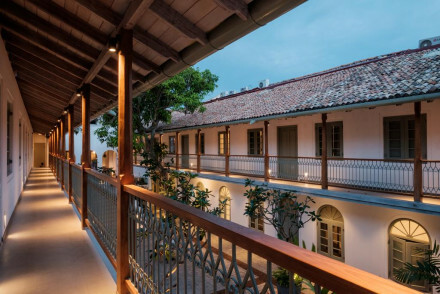 Our pick of the best places to stay in Galle feature a restored merchant's house and an elegant 18th century mansion. Watch the sunset from flag rock boasting views across the ocean and fort. Catch a game of cricket at the atmospheric pitch surrounded by the fort's walls. Explore the myriad of galleries, cafes and little museums located in the pretty winding alleys of the fort. Get out of the city for the day and hit the beach at Unawatuna. Take a walk along the fort walls. The Sun House was originally built for a Scottish spice merchant in the 1860s, and its white, colonial elegance now houses seven rooms, including a large suite. A short walk from the fort, The Sun House has truly special views of Galle harbour. 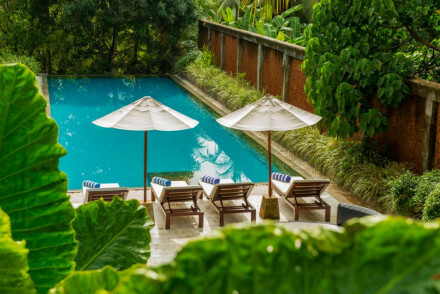 There's also an excellent restaurant serving Sri Lankan food - it's so good, even guests will need to book - and a beautiful, frangipani filled garden with a pool which feels pleasantly private. The Fort Printers is unassuming from the outside but this bijou hotel has had some high profile guests. Behind the traditional facade it's all double height ceilings and modern chic style. The Dutch House is the sister hotel to The Sun House, and is blessed with similarly lovely views of Galle, from its hilltop position. This home was built for a Dutch naval officer in 1712, so the architecture is totally different. The decor inside is as well, there's an interesting selection of antiques and contemporary art on the walls. This is a hip spot, and with just four rooms. Amangalla is Galle's top address. Cast your worries aside as you are taken care of by the world renowned Aman group. Located in a handsome, white colonial building you'll find chic interiors and suites crammed with period pieces and beautiful bathrooms. 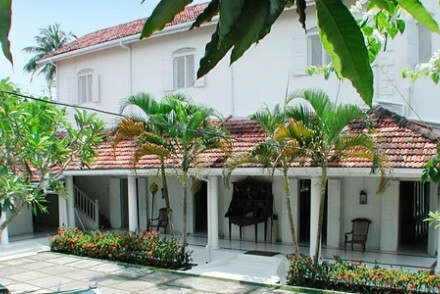 The Dutch House is a peaceful 18th century mansion overlooking Galle. Elegant interiors are decorated in rich ochres with antiques, contemporary art. 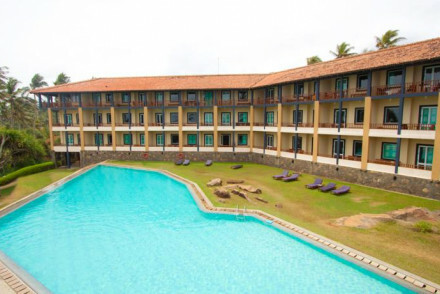 The Fortress resort & Spa is a luxury resort with stunning Indian Ocean views on Koggala Beach. Stylish interiors feature full length windows for maximum views, and contemporary Sri Lankan furnishings. Excellent facilities include three restaurants, infinity pool and Ayurvedic spa. Aditya Resort is a contemporary boutique hotel located on its own stretch of palm lined beach. Airy rooms feature splashes of pop colours, traditional furnishings and design quirks such as split levels and outdoor rain showers. Up in the tea-leaf covered hills surrounding Galle, Kahanda Kanda is a lover’s retreat. Comprised of ten private suites, tucked away in lush grounds, decorated in a luxurious and modern décor. Tri lanka is a boutique eco-hideaway near Galle Fort featuring 11 rooms, mostly in separate villas enveloped in lush greenery. Sleek wood-and-stone restaurant terrace offers top-notch fusion fare. 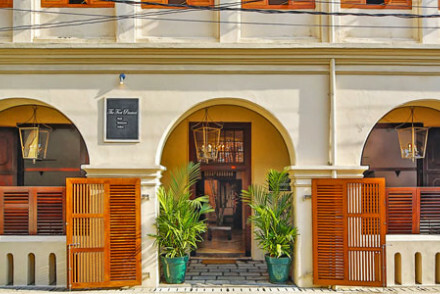 Galle Hotel is situated on the fringe of town and is a tranquil hideaway. 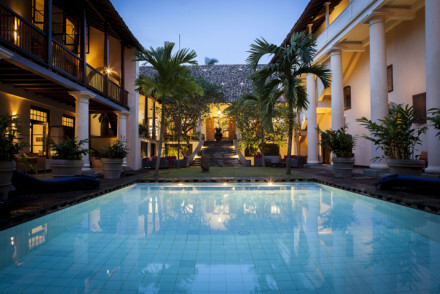 A centuries old property, decorated in a Dutch, Sri Lankan and colonial style. Kikili House is a darling little guest house just outside historic Galle Fort. Welcoming hosts make guests feel right at home whilst colourful artworks and vibrant fabrics add to the charm of this leafy neighbourhood. Jetwing Lighthouse is a chic design hotel housed in this former lighthouse. Blending clean lines with design quirks, bedrooms are light and bright with large bathrooms. A boutique property in the truest sense, it is the small touches that make Why House stand out from the crowd. 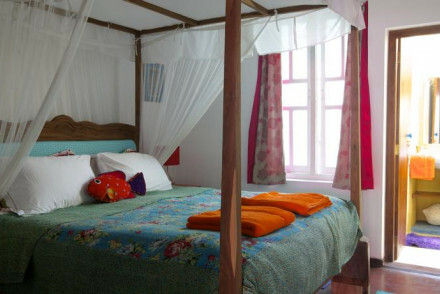 The rooms are decorated with white linens, four poster beds and large windows that let in the breeze. Apa Villa Thalpe is located on its own stretch of private beach with stunning infinity pool. This is the ultimate in well priced luxury. The Frangipani Tree is a chic boutique property set on a quiet stretch of beach. Design is traditional throughout with high beamed ceilings and whirring fans alongside cool contemporary touches such as the luxurious open plan bathrooms. Fly to Bandaranaike International Airport (Colombo) from where it is a 2.5 hour drive to Galle. A train also runs from Colombo to Galle. Best time to visit - Galle is a year round destination with consistently warm temperatures (averaging around 28°C), however expect rains from May - November. 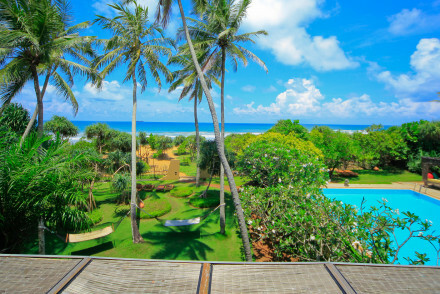 Browse through our list of all the best places to stay in Galle. 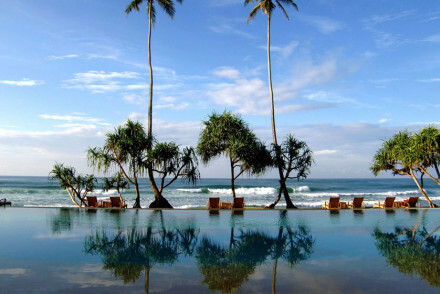 Alternatively widen your search and check out all our recommendations in Sri Lanka. 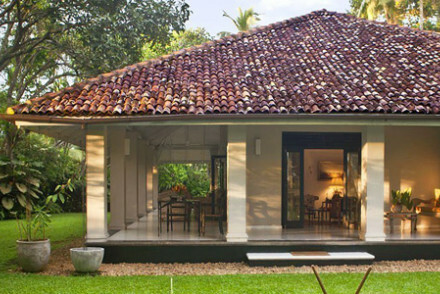 A wonderfully restored bungalow in the heart of Galle Fort. Interiors keep their original charm but there's a fresh contemporary feel. Rooms benefit from large four posters and indulgent bathrooms. A fantastic restaurant set in the atmospheric, high-ceilinged, dining hall is worthy of a trip alone. Darling little guests house just outside historic Galle Fort. Welcoming hosts make guests feel right at home whilst colourful artworks and vibrant fabrics add the charm of this leafy neighbourhood. A delicious breakfast of familiar Continental dishes and Sri Lankan hoppers (a must try!) is included. Luxury resort with stunning Indian Ocean views on Koggala Beach. Stylish interiors feature full length windows for maximum views, and contemporary Sri Lankan furnishings. Excellent facilities include three restaurants, infinity pool and Ayurvedic spa. Perfect for beachside relaxation. Unassuming from the outside this bijou hotel has had some high profile guests. Behind the traditional facade it's all double height ceilings and modern chic style. Lunch and dinner are tailored to your preference. But with Galle town on your doorstep you have plenty of options. A design dream! 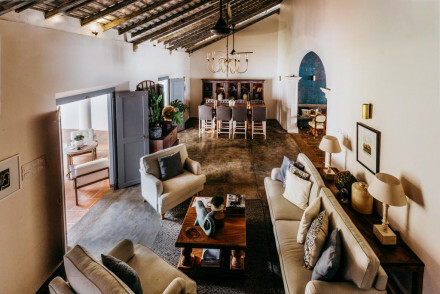 A painstakingly restored heritage home set in historic Galle. Chic design throughout reflects the property's Moorish roots with delicate detailing found in carefully placed tiles, mosaic cushions and pendant lamps. A luxury spa, pool and exemplary restaurant make this the ideal retreat. Local exploring - A property filled with history set within the walls of the old Galle fort. Cooking classes - Take a cookery lesson at The Church Street Social. Chic design hotel housed in this former lighthouse. Blending clean lines with design quirks bedrooms are light and bright with large bathrooms. There are plenty of hotel activities, from tennis to fishing, making it great for the whole family. Interiors make the most of unspoilt sea views. This charmingly restored merchant's house has great hillside views. Exquisite bedrooms and suites in all-white-ethereality are the piece de resistance for any romantic. An intimate atmosphere with communal dining and lovely gardens. A hip hotel, with many accolades, ideal for completely unwinding. Romantic Break - Relax and unwind with your loved one in this idyllic property. Sights nearby - The Kataluwa Buddhist temple is hidden away in the jungle outside Galle. Great walks - Take a walking tour through Galle Fort. A wonderfully nostalgic 5 star hotel on the outskirts of Galle. The beautifully restored property offers luxurious colonial style suites, lush green gardens, a pool and a fantastic spa. The restaurant serves a mix of traditional and international cuisine and the elegant bar is not to be missed! Situated on the fringe of town this hotel is a tranquil hideaway. 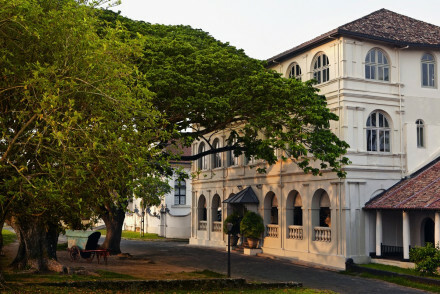 A centuries old property, decorated in a Dutch, Sri Lankan and colonial style, houses a lively restaurant great for mingling with fellow travellers. Loft suites are by far the best. A sun-dappled pool will leave you sun trapped! Boutique eco-hideaway near Galle Fort, 11 rooms, mostly in separate villas enveloped in lush greenery. Sleek wood-and-stone restaurant terrace offers top-notch fusion fare, plus views across Koggala Lake. A romantic haven. World class yoga and excellent spa also make it the ideal detox escape. Great walks - Explore the local tea estates and learn about Sri Lanka's famous "Virgin White Tea"
A contemporary boutique hotel located on its own stretch of palm lined beach. Airy rooms feature splashes of pop colours, traditional furnishings and design quirks such as split levels and outdoor rain showers. An international lunch and dinner menu is available as are Ayurvedic spa treatments. Up in the tea-leaf covered hills surrounding Galle, Kahanda Kanda is a lover’s retreat. Comprised of ten private suites, tucked away in lush grounds, decorated in a luxurious and modern décor. With private dining, spa treatments and plenty of activities this is one for hopeless romantics. 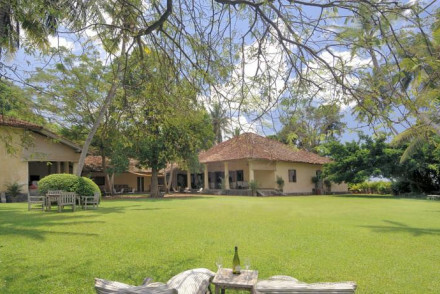 A peaceful 18th century mansion overlooking Galle. Elegant interiors decorated in rich ochres, antiques, and contemporary art with lovely gardens to unwind in. The adjoining hotel has the best restaurant in Galle. 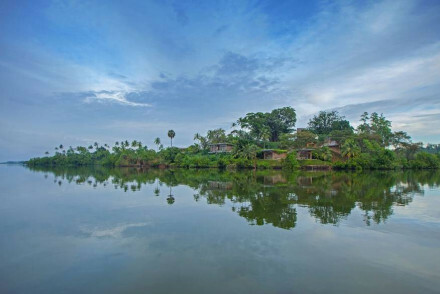 A tranquil and romantic base to explore Galle and its surrounding areas. Hideaway - A chic boutique hotel with just four elegant and airy suites, in lush gardens filled with coconut trees and sun loungers. Great walks - Take a walking tour of the historic Galle Fort, especially a sunset stroll along the walls. Local markets - Visit the nearby villages and pick up some local delights in their markets. Diving - Head up further north for scuba diving at Unawatuna. Galle's top address. Cast your worries aside as you are taken care of by the world renowned Aman group. Located in a handsome, white colonial building you'll find chic interiors and suites crammed with period pieces and beautiful bathrooms. Elegant dining and a sumptuous spa complete the picture.